★Special Guests, Soul Fire Farm! : Leah Penniman and Jonah Vitale-Wolff of Soul Fire Farm teach us alternative ways to use our torches and pitchforks to bring about social change. We also discuss why there can be no real revolution without getting our hands dirty. ★Fiftyish Anniversary Edition! 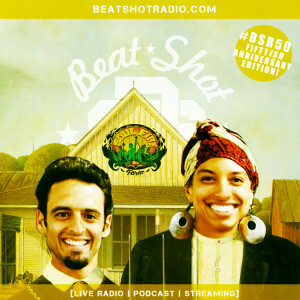 : The Beat*Shot Radio Podcast has been live for a full year! Tweet your favorite BSR memories to @BeatShotRadio using the hashtag #BSR50. ★Farmer Trivia! : A lightening round of trivia relying heavily on random pop culture references to farming. ★If Looks Could Kale: Tighten your overalls! We talk farm fashion and discuss whether function always trumps form in the fields. This topic is primarily an excuse to make a kale pun. ★Rebel With A Cause: Recently, hip-hop activists and reporter Rebel Diaz confronted presidential hopeful Ted Cruz in the Bronx regarding his positions on climate change, stating poor and immigrant communities are “the front lines of environmental racism” who “deal with climate change every single day.” We discuss. ★Sign ‘O’ the Times: What does Prince’s death signify for Black culture and music? Do iconic artists of color play a bigger role in their corresponding communities and cultures than white artists? ★Hunger Pangs: A year after Samuel Harrell was murdered by nearly 20 corrections officers comprising a “Beat Up Squad” in Fishkill Correctional Facility, the family has gone on a hunger strike to bring awareness to the case. It’s working. Text “SamFree” to 91990. ★Becky With The Good Hair: This week Beyoncé gave us Lemonade, so we have no choice but to sip it. ★Respeck It: Was Birdman aka Baby’s latest interaction on the Breakfast Club Radio show a carefully planned publicity stunt, a shining example of male fragility, or both? We discuss.